Knights Armament SR30 9.5inch .300 Blackout Upper Receiver #32310 On Sale for $1599 each. The SR-30 E3 Mod 2 takes advantage of the .300 BLK, offering a 9.5” barrel that is as capable as an 11.5” 5.56 mm SBR, for a significantly more transportable and maneuverable firearm. The QDC compatible Flash Hider will mount any of the KAC 7.62 mm QDC suppressors. The SR-30 has 99% parts compatibility with the SR-15, requiring only a dedicated barrel and muzzle device. Seamlessly transition from subsonic ammunition to supersonic with nothing more than a change of the magazine. 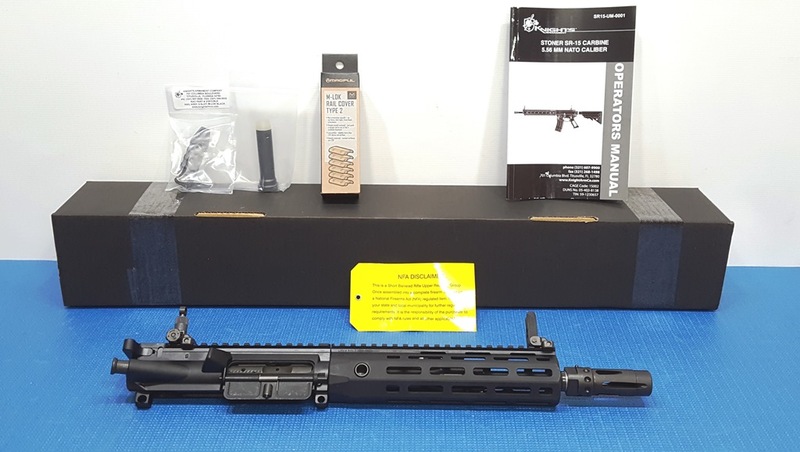 These are new in box factory fresh Knights Armament #32310, 9.5 inch barrel .300 Blackout caliber, MLOK handguard Upper receivers on sale for $1599. These come with an MLOK hanguard, Knights flip up sights, Full auto carrier, the correct weighted KAC buffer, rail covers and a picatinney rail section. These are the shortest upper in production at this time from Knights Armament. Call Chuck to place your order, Thanks. Upper Receiver Kit, SR-30 MOD 2 9.5" Barrel, M-LOK"